Monday, March 24, 2014, The TV5 News Broadcaster Erwin Tulfo filed libel complaint against the Philippine Daily Inquirer for publishing a story, libelous and malicious article in PDI dated March 19, 2014, headlined "Payoffs to media bared. ", linking him to alleged media payoffs amounting P245,535 in 2009 that was said connected to Pork Barrel Scam. According to ABS-CBN News, the complaint affidavit by Tulfo contains a case against PDI editor-in-chief Letty Jimenez-Magsanoc, managing editor Jose Ma. Nolasco, news reporter Nancy Carvajal, and news editor Artemio Engracia in relation with their libelous posted news article on Philippine Daily Inquirer. He said that he received a legitimate advertising slots payment when he was still a radio commentator of Radio Mindanao Network (RMN) radio. 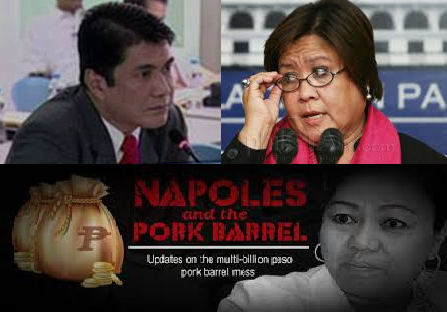 Victor Roman Cacal and Rhodora Mendoza said Erwin Tulfo received a check for P245,535 dated March 10, 2009 drawn from a National Agri-business Corporation (NABCOR) account at United Coconut Planters’ Bank (UCPB), Tektite Branch PSE Center, Ortigas, Pasig City. Cacal was previously head of NABCOR's general services, while Mendoza used to be NABCOR's vice president for finance. They were the two who can shed light on how lawmakers supposedly plundered their Priority Development Assistance Funds (PDAF) according to Miriam Defensor Santiago during Senate Resolution 575. The checks with the same amount (P245,535 ) and UCPB account received by Erwin Tulfo were similar to Carmelo del Prado Magdurulang (Del Prado) received (dated April 27, May 14, and July 6 in 200) and it is part of documents submitted by Mendoza and Cacal to the Office of the Ombudsman in relation with Pork Barrel Scam investigation. Cacal also said that apart from the vouchers justifying the processing of the payment, no other documents were provided to justify the expenses. Erwin Tulfo said that he is willing to face any Senate inquiry or justice department investigation about this issue. People of the Philippines are watching over about this Big Time 10B Pork Barrel Scam. This issue may or may not be connected to each other but surely it will contribute to further explanation on how this scam were done.